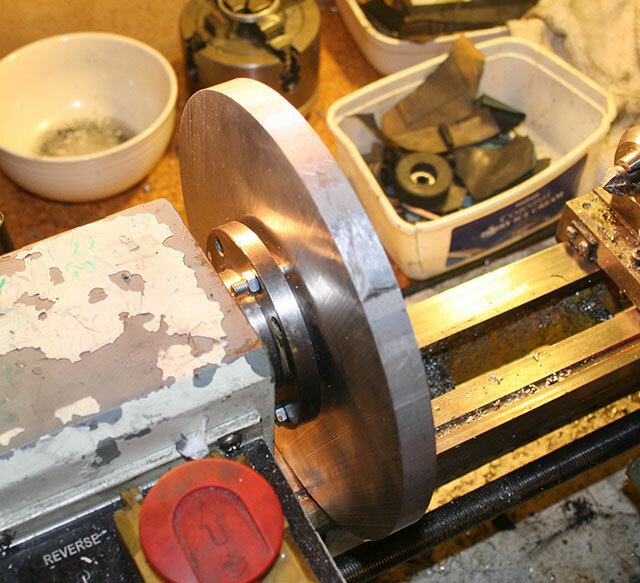 Continuing the series on making a matched telescope worm wheel and gear set on a mini-lathe, the next stage is to drill the bolt holes for mounting the worm wheel blank on the spindle of the mini-lathe. 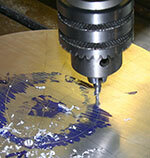 You need to start with your smallest center drill and either a drill press or a milling machine. 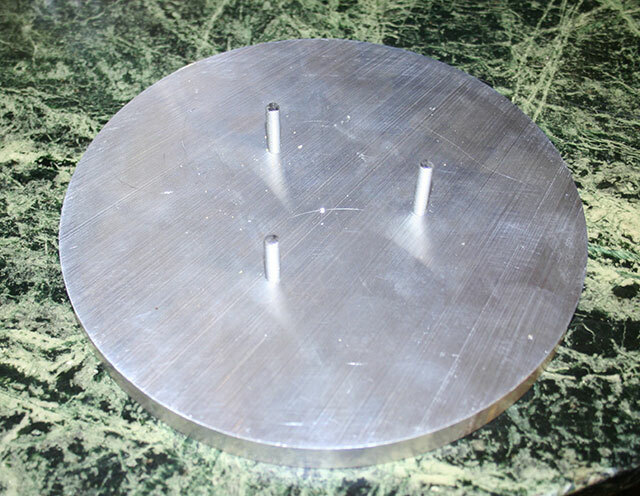 The target is three holes drilled with a 4.2mm drill bit in the worm wheel blank. Place the worm wheel blank on the bed of the milling machine and hold it firmly flat with your hand. Make sure that the center drill is above one of the slots in the mill table so that you do not drill into the mill table. 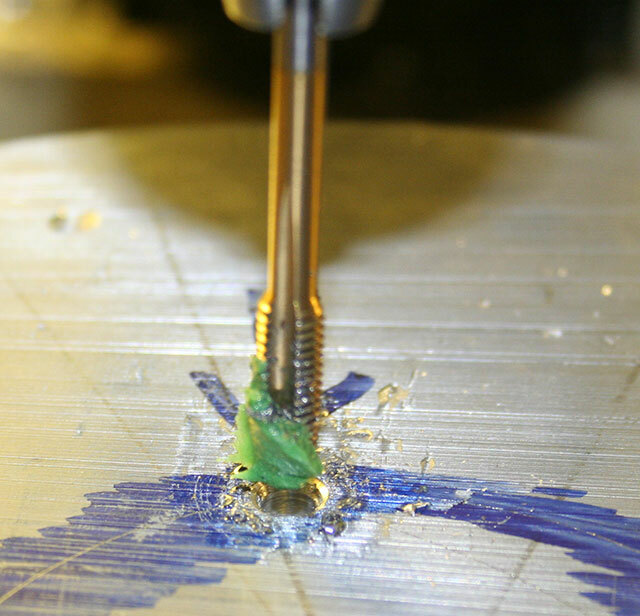 Lower the center drill into the punched hole, but allow the worm wheel to move slightly so that the center drill adjusts itself to drill in the center of the punch mark. Drill quite deeply with the center drill. Now, put a heavy weight on the worm wheel so it doesn't move, and swap the center drill for a 4.2mm drill bit. Lower the drill and drill through with the 4.2mm drill bit, again, holding the worm wheel very flat and very firmly against the mill table. The process ensures that the drill hole is true to the surface of the worm wheel, and goes in exactly in the position of the punched hole. Repeat the process for the other three holes. Although this is a bit long winded, it does ensure the correct positioning. A worm wheel is a huge investment of time and effort, so it is best not to cut corners at this stage - not that the wheel has any corners. The three holes must now be tapped using an M5 tap. I often use the milling machine to help me with the tapping, but use whatever process you are comfortable with - just be sure the tapping occurs perpendicular to the wheel surface. Make sure the drill holes are well de-burred before and after the tapping. 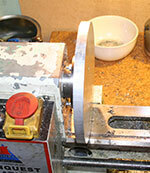 Finally, insert M5 studs into the tapped holes and bolt the worm wheel blank to the spindle of the lathe. If you are feeling brave you can do this with M6 studs and holes, however, this requires very good precision with your marking out. Mind you, this is probably to be recommended because of the cutting forces the wheel is about to be subjected to. At this point you might discover that the wheel is too large to turn on the lathe, by a few mm. The only options here are to either file the outer diameter down a bit, or take a dremel to the bed of the lathe and make a mini-lathe gap bed. Now we actually need to do some turning - but first some centering - so go and find your dial indicator and make a cup of tea!